Prescription drug coverage can sometimes feel overwhelming. I know — I recently navigated an authorization process for my teenage son’s acne medication that took several phone calls and 10 days to complete. And I’m not alone in feeling stressed about prescription coverage ﻿—﻿ according to a recent survey conducted by Walgreens, 37% of the more than 31.5 million people enrolled in prescription drug plan Medicare Part D worry about their prescription drug costs. 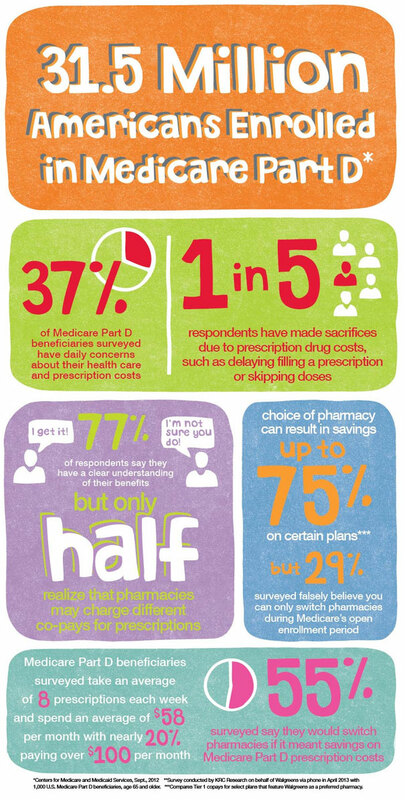 And 20% say they’ve made sacrifices to help manage costs, such as delaying the filling of a prescription or skipping doses. Moreover, while most beneficiaries surveyed say they have a clear understanding of their current plan benefits, many don’t understand that there can be several differences between plans. Only half realize that copay amounts may vary by pharmacy. And 24% are not sure whether their plan offers a preferred pharmacy option, which can offer cost savings above and beyond network pharmacies. Although Part D Plans must meet certain standards, these plans are not all the same. Nationally, there are hundreds of different plans. But thankfully, you do not need to compare this many ﻿— ﻿there are generally 20-30 plans available in a given service area. In short, if you have Medicare Part D, you might be paying more than you need to. This article can help you understand plan features relating to coverage and cost so you can make an informed plan decision. Here are cost factors to consider when you compare Medicare Part D plans. You pay a fixed monthly premium for your Medicare Part D Plan. You must reach the annual deductible before the plan covers any of your prescription drug costs. Some plans have a deductible of $0, so initial coverage starts immediately. You share in the costs of your prescription drugs with the Part D Plan by making a copayment (set amount for each prescription) or paying a coinsurance amount (a percentage of the cost of the drug). Each plan has a formulary, or list of drugs covered by the plan. Within the formulary, drugs are assigned to tiers. Cost-sharing arrangements (either copayment or coinsurance) are based on the drug tier. Typically, there are tiers for preferred and non-preferred generic drugs, preferred and non-preferred brand-name drugs, and specialty drugs. Part D Plans may have a list of pharmacies inside their networks. Prescriptions may be covered only if you use a network pharmacy. Some plans have preferred pharmacies that offer lower prices, beyond the plan savings available at network pharmacies. Using a preferred network pharmacy may potentially save beneficiaries hundreds of dollars per year in copay costs. You can compare Medicare Part D Plans by using the Medicare Plan Finder (an interactive tool on the Medicare.gov website) and evaluating materials provided by plan sponsors. Choose plans from the results to compare details including monthly premiums, deductibles, estimated annual costs of drugs at a retail pharmacy, and ratings. Note that drug costs are listed by pharmacy name and vary depending on the pharmacy’s status within the plan. Review your Medicare Part D plan. Talk to a Walgreens pharmacist about cost concerns and ways you might be able to save. You can schedule a free appointment directly online. Compare copay and other costs against your current plan and pharmacy. Armed with an understanding of Part D Plan costs and terminology plus knowledge about your specific plan, you can have a meaningful and enlightening conversation with a pharmacist about possible ways to save money on prescription drugs. Below are more detailed results from the Medicare survey. 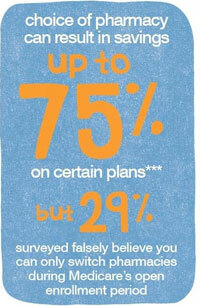 Are you surprised by these findings? This post was made possible by support from Walgreens. Walgreens is in the network of hundreds of Medicare prescription drug plans and participates in the preferred networks of four national Part D sponsors. The company offers savings of up to 75% on prescription copays over select pharmacies for a number of plans in which it is a preferred pharmacy. Great article Julie. In the last couple of months I've had to deal with some miscellaneous health issues with my parents -- nothing serious but each incident is a good reminder of how fragile our bodies can become and how important it is to completely grasp the in and outs of one's healthcare plans. I hope this guide can help people understand their plans better. I had no idea how complicated they could be as I thought the plans were much more standardized until I started doing research. Hope your parents are doing well!